Dwight is a dear friend recently diagnosed with cancer. I want to gift him with words and reminders of things that are precious to him–things that fill his heart with peace and joy and hope. 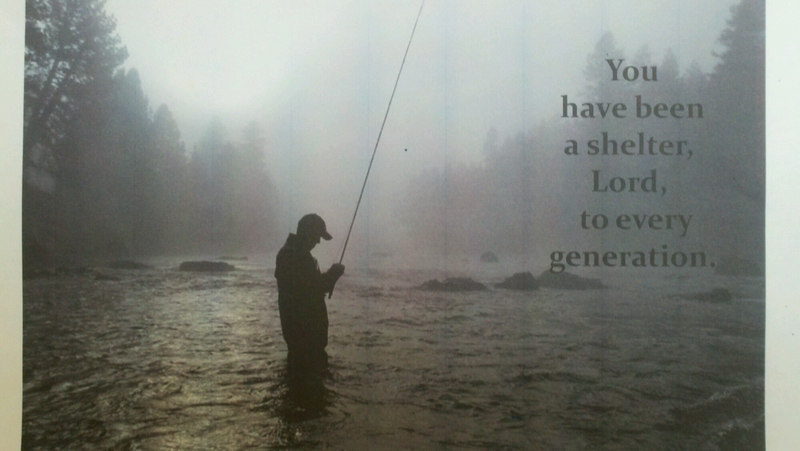 Dwight and his wife, Jan are avid fly fishermen. 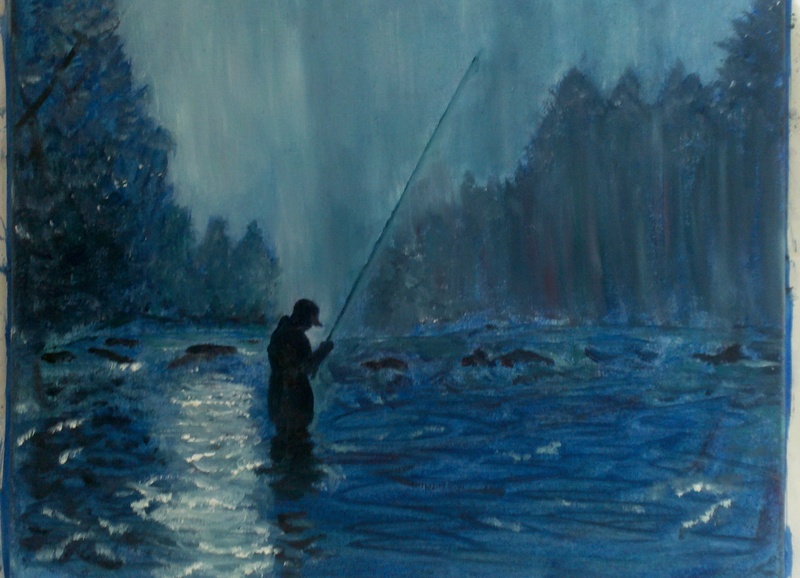 I googled images of fly fishing and was captured by this early morning one shrouded in mountain fog. The picture did not have the amber tones my camera picked up and I added a verse to it on power point but decided to attach it to the back of my canvas in a card instead at the suggestion of my daughter. What do you think? It’s been a long, hard journey for Dwight. He’s had chemo, radiation, a feeding tube and near death hospitalized for aspiration. It’s been a privilege to participate in Dwight’s recovery and, as a nurse, facilitate his rehab efforts. Now he is on the other side, praise God! Dwight’s PET scan showed no evidence of cancer in his entire body! Next stop: feeding tube out! Woohoo!!! 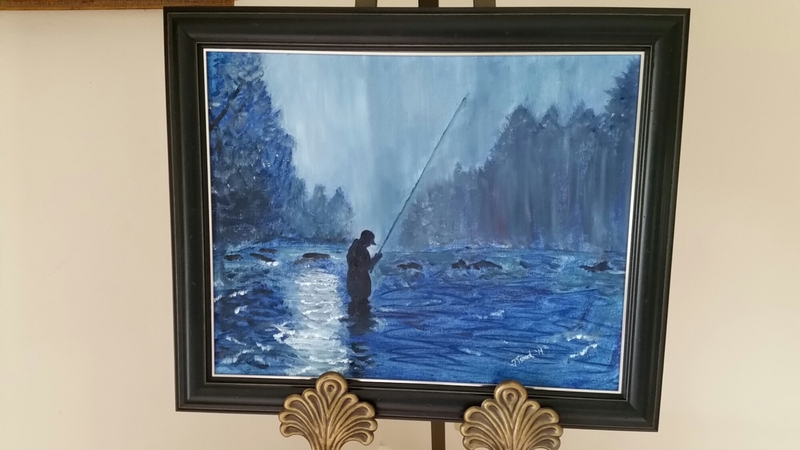 So, about the painting, the neatest and sweetest pay I could ever receive was when Dwight said he would visualize my painting every time he was in the radiation tube receiving treatment. It brought him peace and encouragement. Thank you Jesus! Dwight had the painting framed and displays it in his living room on a cool easel. Here it is! A small act of kindness can warm someone’s heart to the fullest. I appreciate the generosity and love you are radiating. Keep up the good work. Prayers Assured! Thank you. You are kind. I pray as Jesus heals Dwight he will see the gift as a symbol of God’s compassion and faithfulness. Blessings! Gratitude to you as I am hungry of blessings. Thank you. I know you have had a journey and a hard story to tell. Thank you for sharing your links. I will visit and pray the Lord will continueto pouring His blessings into your life. I am so sorry to hear this news Jan. Your message comes from a deep place of love and compassion and with its empathy and love, I really think it will comfort your friend by travelling from your heart to his. God intends us to do life in partnership with Him. God loves Dwight more than I ever could and He is using me to thrill Dwight. God wants Dwight to expect miracles. God wants Dwight to expect good things. I am so grateful to be chosen as God’s co-conspirator in this wonderful surprise from Him to Dwight. My husband and I will drop it by tomorrow night. We are both so excited to see Dwight’s response. This is the best fun ever! It really is more blessed to give than to receive! Thank you so much. God gave me a burden and I asked Him to show me how to do this. With His help it turned out far better than I ever thought I was capable of. My husband and I will drop it by tomorrow night. I feel we are co-conspirators with God in blessing Dwight. God loves Dwight more than we ever could and He delights in using us to spread the love. I can’t wait to see his face when he opens our present! lol. Love the Monet/Giverny touch… And the intention. And my thoughts go to your friend Dwight.